Personal statement’s are written and edited by Tim Cleary, the head of the admissions team at BrightLink Prep. He can be reached at info@brightlinkprep.com. Over the past year or so I have been getting a lot of requests from students in Pakistan regarding sharing a sample personal statement for the Fulbright scholarship. This sample Fulbright personal statement has been shared with me by an anonymous but successful Fulbright applicant who has allowed me to share her personal statement on this blog. It can be used as an example to give you an idea of how to write and structure your own personal statement for the Fulbright program in Pakistan. If you feel you need a little extra help, you can always contact me to check if I can help but please DO NOT copy chunks from this statement of purpose, or plagiarize them directly. You will not only lose your chance of getting the Fulbright scholarship but it is also unfair to copy someone’s original work. Simply use this to as a reference guide for writing your own authentic personal statement. Before you go on to read this sample personal statement for Fulbright scholarship, let’s do a little exercise to warm you up for writing your own statement of purpose. So here it goes: Which of the following sounds more appealing? I went down the building to the cafeteria, which looked good, and bought a burger that I ate. I strolled down the building as the cafeteria fragrances wafted through the air. I then bought the best chicken burger I have ever tasted. Of course you would say that the second one is better. This is so because it is more descriptive and creates a more vivid and inspiring picture in your mind. But at the same time it requires the right set of words to describe the situation which is slightly more challenging. So a word of advice – just write more descriptively so that its all the more exciting to read! BORING: I performed in my first GRE exam today. EXCITING: I blew the GRE test away in my first attempt. EXCITING: Ignoring risks and malfunctions, I did a complete antivirus run on my new computer. Just know that you all have remarkable stories to share – you just need to dare to be more descriptive! Click here to view the sample personal statement for the successful Fulbright Scholar in Finance! Personal Statement is all about general stuff whereas study objectives focus on what you want to study in the US. Infact if you look at the form you will see that FB has clearly given the instructions of what should be included and what should not be in a SOP/study objectives. Is there a way I can send you my Personal statement and you just read it once? I don’t know if good or not. Hello Sartor – You can email us at info@brightlinkprep.com or contact us at 0331-4513196. Kindly guide me regarding Letter of intent. What areas must be covered in that letter? Hi Saba, A letter of intent is the same as a Personal statement. Could you please explain to me about study objective and research objective? what are the differences? And which one should we choose? Thank you beforehand. Kaneka, Where did you see this research objective requirement for FB? If you can point it out then i can better help you. CV is a resume – a brief summary of your professional and academic experiences. Personal statement is a detailed analysis and insights into your personal and professional history. How do we prepare for GRE? I will complete my degree by November this year, so I will apply next year when the applications are open. I can’t come to your city, so is there any way you can guide me about effective GRE prep, books, and other things that I must get straight before I srart working on my application next year? Hi Jia, Before i go on to help you out can you tell me what is your academic background like? Hello! I am a senior student in tourism management. 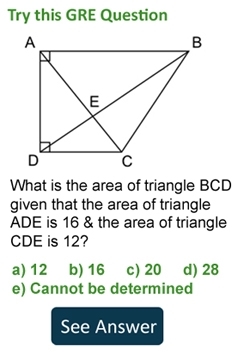 Do I have to take GRE exam. Can candidates having MS in Management Sciences apply for Fulbright PhD Scholarship?. WAS! Hi Arslan, Please send us an email at info@brightlinkprep.com and we will see what we can do for you. Sir i want to do MBA could you please tell me the difference between GRE and GMAT and which one i should prepare? Please read this: http://brightlinkprep.com/difference-between-gre-and-gmat/ For MBA go for GMAT. I want you to please proof read my SOP. I have done my majors in geotechnical Engineering. Want to pursue phd. Kindly tell me regarding the fee if any? Glad that you’re helping us. I’d like to know how can i overcome the negativity part in my SOP. I am almost done with the SOP, got the second opinion, however the persistent issue is with strengthening of the whole document. Although it addresses the whole thing but still some negativity is overshadowing the good things. Hi Waqas, You are welcome 🙂 you can contact my essays team at tim.cleary@brightlinkprep.com and they will help you with the essays thing. Well done,God bless your team. can ypu please tell me what to write in statement of purpose for financial aid? Hi Manisha, There is no separate SOP for financial aid. Helo Umar! I have done msc botany with 2.61 and Im 26 can I apply for the mphill. Reply plz..
Hi Talha Omer, I just want to thank you for the kind help you are giving to various people. Aoa, Talha bhai what are the difference between personal statement and SOP? Are they same? I am applying for Fulbright 2017 and I am also working with a research organization. As you know the deadline for FB 2017 is 11 May, I am planning to give GRE in first week of May. I am preparing for it myself at home from KAPLAN books. I am having difficulty in memorizing vocabulary. My vocabulary is already very weak. Any advice how should I go about this? Hello – well unfortunately the only way to learn vocabulary in such a short amount of time is memorizing. If you had a lot of time then reading a lot would have helped but not in a month. Hi Talha, I am going to apply for a scholarship program, NTHP at IBA – Karachi, I am having some problems while writing the SOP but i have written one, Will you please proof read that ? 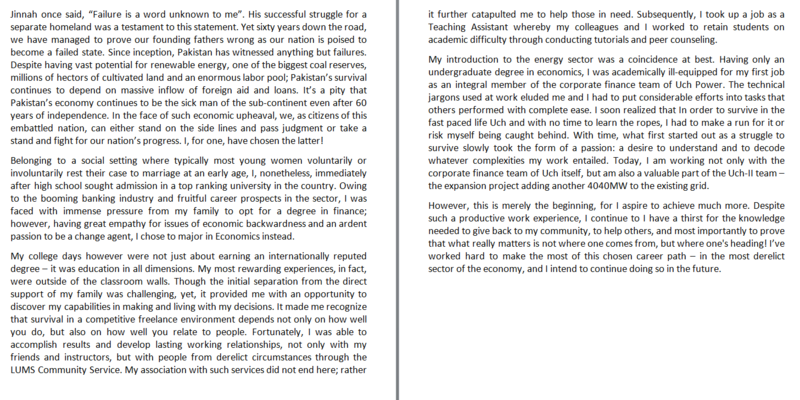 Hello – personal statement attached in the above article. Hi dear Sir, I am in final year of my Bachelors in Engineering (Chemical Engineering) from Mehran UET, Jamshoro, Sindh, Pakistan. I want to hunt a scholarship for my Masters in Engineering in any foreign country. Can I use an urdu phrase on my fullbright application? Yes you can contact us at 0331-4513196. Hi, I was enrolled in a Ph.D. program in Pakistan, did some research work too, but then left that program and it got cancelled. Do I need to mention that in my resume? Asking this since my research objectives will be based on the same and My research experience and course work were very relevant and course work went quite well too, i scored 3.67 GPA. Or shall i mention it as part of continuing education? WAS Umair, you can simply call us at 0331-4513196 and we can set up a time with you to discuss your profile and way forward. Can I send to you a copy of my resume and sample cover letter to help me draft objectives and motivation on FLTA? I thanks in advance for your time and cooperation. Hello – All personal statements have been shared above on the website. WS Fatima – for Personal statement assistance please contact 0331-4513196. I need detail information about the best personal statement, suppose which point should be kept in mind and which should be avoided. I really need information for writing best articles for Fullbright S.
MAY I HAVE A SAMPLE OF A STATEMENT OF PURPOSE FOR A SCHOLARSHIP IN PHD IN MATHEMATICS. thank you for your help: i am graduated for law faculty and want to develop my knowledge, i need your help to write my statement. can you help? Hello – yes we do help. You can contact us at 0331-4513196 to have your essays reviewed. Hello – No there is no need for any letter. can you help me writing few statments for commonwealth scholarships. Well don’t have any in Bio tech!